Dry-lining stud partition walls is a project any homeowner can take on; you just need to have the right tools, materials, and knowledge. This guide will walk you through the whole process of dry-lining, from selecting the right plasterboard to taping and jointing. Note: If you're dry-lining brick walls, please check out Dry Lining Brick Walls - The Complete Guide, or if you're looking to plasterboard over an ugly ceiling, check out How To Plasterboard Ceilings. Before you get started, this guide assumes that you already have your stud partition walls fitted. Important Note: If you have a metal stud wall, you will need to fix the plasterboard with screws instead of nailing. Remember to wear safety goggles, dust mask and gloves before carrying out any dry-lining work. When it comes to buying the right materials, the key decision is selecting the right plasterboard. Before you make your selection, you first need to consider which type of room you're creating. For example, if you are building a new bedroom, it's essential that the board has solid sound insulation. However, if you're creating a new bathroom the board will need to be moisture resistant. Other important plasterboard attributes include resistance from impact and fire. You should also be looking for tapered-edge boards, as they make it easier to get a smooth finish when taping and jointing. Another consideration, is how much weight the board can handle per screw, especially in areas where wall-mounted items cannot be directly screwed into a noggin or stud. How much weight can the board handle per screw? Take your time, and consider all the attributes above and the room you're creating before purchasing your plasterboard. See our 'Dry Lining Brick Walls – The Complete Guide' post for a full list of tools required for taping and jointing. Plasterboards typically come with a protective plastic coating, Don't remove this coating until you're ready to start work. Keep the boards in a dry room and on a flat surface, as this will prevent bowing. If the boards do become damp, don't use them until they've completely dried out. Whenever handling plasterboards, wear gloves, and always carry the boards on their edge to minimise the risk of damage. It's also important to have some help, as even experienced plasterers can damage boards when working alone. If you cannot get anybody to help, another option is to buy smaller boards that can easily be handled by one person. The trade off is cost (you have to buy more boards) and time (you must fit more boards). You'll need to cut the sheets to fit, especially if your walls and ceilings are not entirely straight. Lay a plasterboard sheet on the floor and measure 12mm less than the floor-to-ceiling height. Before you start fitting plasterboard, please watch this video and familiarise yourself with the process. After you've watched the video, continue with the steps below. Important note: Standard plasterboard has a grey side and an ivory side. 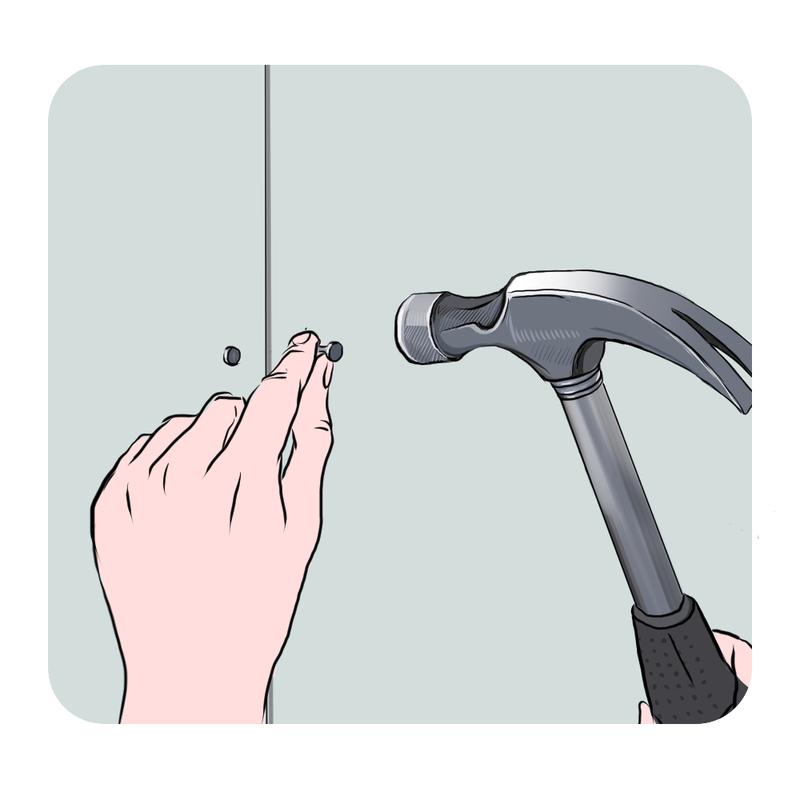 Make sure that the ivory-side of the plasterboard is facing outwards when fixing boards. See our 'Dry Lining Brick Walls – The Complete Guide' post under the heading 'Taping and Jointing' for a comprehensive guide on how to finish dry-lining with tape and jointing. There are faster ways to cut and fix plasterboard than what is described above. E.g. you could use an electric saw to cut the plasterboard and/or a pneumatic nail gun to fix them. However, these advanced techniques add cost and require more skill. Therefore, I feel the dry-lining methods described in this guide are best suited for first time DIY enthusiasts. If you plan to do lots of dry-lining, please consider these time-saving tools.